LUCKNOW, India – Every time second-year undergraduate law students at Lucknow University open up their 14-inch Hewlett-Packard laptops, they are reminded of the generous benefactors who gave them their computers. Sitting in a hot classroom at Lucknow University, Ankita Singh, 19, turned on a laptop and signed in. As she waited for the desktop to load, the screen flashed red. It lasted for all of two seconds, but the two faces that appeared on the screen were unmistakable: Akhilesh Yadav, the chief minister of Uttar Pradesh, and his father, Mulayam Singh Yadav, who is the Samajwadi Party president and also a candidate for prime minister. 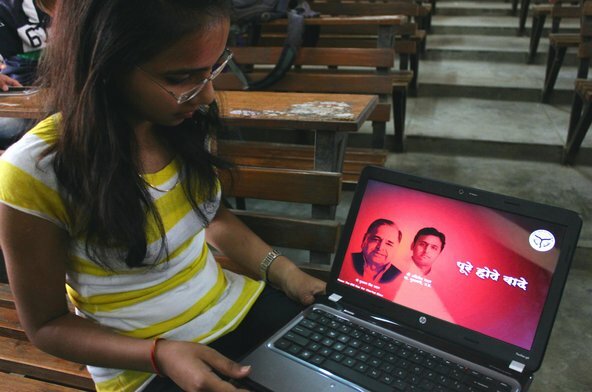 Another student in the classroom, Abhay Rajvanshi, 20, said the Samajwadi Party, the regional party that governs the state of Uttar Pradesh, distributed the laptops in September to fulfill a campaign promise after it won the 2012 state assembly elections. “If I am getting a laptop, then they think — and I also think — that I have to support this political party, because this political party has given me some gift,” Mr. Rajvanshi said. Be it laptops, TVs or even goats, party promises of gifts and special privileges are the norm in Indian politics. The laptops given to the Lucknow University students were part of the Samajwadi Party’s plan to deliver 1.5 million laptops and tablets to Uttar Pradesh students who had successfully completed Class 10 and Class 12, the final year of secondary education before moving on to university. Students who completed Class 10 were supposed to have received tablets, and their counterparts in Class 12, laptops. But the party’s plans went awry as the distribution of laptops faced a number of delays. The tablet distribution was shelved entirely. Some speculated that the party had failed to realize the scale of its promise, and was forced to re-prioritize its gift-giving plans. “Some people said it was no use to give Class 10 students laptops because they’re not voters,” Mr. Rajvanshi said, with a shrug. The Samajwadi Party denied that it abandoned the tablet plan on the basis that Class 10 students are not voters. The party said that the prohibitive costs of providing high-quality tablets was the actual reason the plan was dropped. Under Indian election law, the rules for gift giving are fairly straightforward: Parties can promise a great number of things before the elections as part of their campaigning, but they cannot hand out freebies while the Model Code of Conduct is in effect, from March 5, the day the election dates were announced, to May 12 — not that the law stops politicians and parties from trying. The Election Commission said in the three weeks after the election dates were announced in March that it had already seized a record $36 million in cash, more than 10 million liters of liquor and 100 kilograms of heroin that it said were to be used for buying votes. Sometimes the gifts arrive even when the recipient does not want them. Right after the election season began on April 7, Tariq Khan, a journalist with one of Lucknow’s English-language dailies, received an invitation for a social gathering sponsored by the Samajwadi Party to garner support for Mr. Mishra. Mr. Khan could not attend, so the party’s press officer insisted on meeting him after the event to drop off a press release. If the gift was intended to win over Mr. Khan, it failed. He is a Muslim and doesn’t drink. Mr. Khan said it was the first time in his 16 years as a reporter that he had received alcohol as a gift. After finding the wine, Mr. Khan said, he had a heated exchange via text message with the press officer. Mr. Mishra denied handing out gifts to journalists. “At least for myself — I’m only speaking about myself — no favors, no giveaways,” he said. If the party was hoping that the $250 laptops would help sway young voters, who went to the polls Wednesday, it is likely to be disappointed. Ms. Singh and Mr. Rajvanshi, the Lucknow University students, while pleased with the party’s gifts, said they knew a political ploy, especially when it was staring them in the face every time they opened their laptops. They declined to reveal their choice of candidate. They also scoffed at the party’s boast that the laptops would be revolutionary for students. In rural areas of Uttar Pradesh, where access to electricity is uncertain, the devices do not really make sense, they said. Sonia Paul is a freelance journalist based in Lucknow, India. Foll0w her on Twitter @sonipaul. This piece was originally published on April 30, 2014, on the New York Times.